In order to meet the unique demands of our customers, the Group has invested time and resources to ensure high quality levels of both products and services offered. The shelves and drawer units and all other products are designed to be lightweight, extremely durable, providing problemless use for years. At the same time, all our personnel have been trained under the Syncro philosophy of working individually with each customer to find the best solution for his or her particular needs, as well as then providing fast and secure installation. Syncro System also guarantees the customer continued after-sales service support, revisions and disasemblage of units if necessary. In order to give official recognition to the quality system of the Syncro System Group, on January 26, 2012 the international certification body, TUV Rheinland Italy, issued the certificate that the Syncro Group has applied in their Quality Management System encompassing design, production, installation, marketing, and servicing of products and accessories for the upfitting of commercial vehicles. The group Syncro in fact prides itself in being responsible for all stages of production, from design to assistance, in the two main production facilities in Cassola (VI) and in the other eight assembly facilities in Italy. The inspection and controls by TUV showed that our management and control systems are ideally suited to provide customers with products and services of the highest level, to manage eventual problems that might come up, and to guarantee a commitment to continuing improvement on quality levels in the future. On March 11, 2004, the prestigious organization TÜV Rheinland Product Safety GmbH conferred the GS certification upon the Francom Spa. GS stands for "Geprüfte Sicherheit" (which literally means "Tested Safety”). 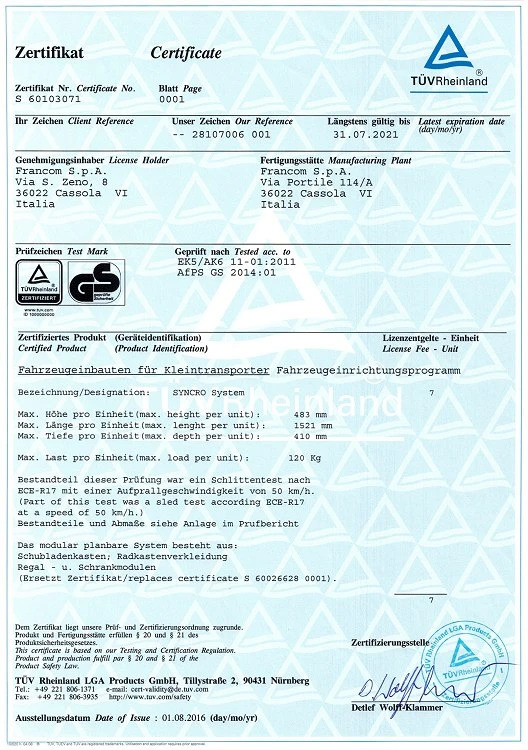 This non-compulsory certificate, issued by a governing standardization organization, is a clear manifestation of the fact that our product conforms to the corresponding technical testing standards and ensures a safe product for the end-user. In must be kept in mind that the manufacturing facilities are subject to an annual inspection by the certification body. The test is conducted according to the ECE R17 standard (the latest edition). This standard includes a crash test involving the vehicle being driven into a barrier at a speed of 50 Km/h. 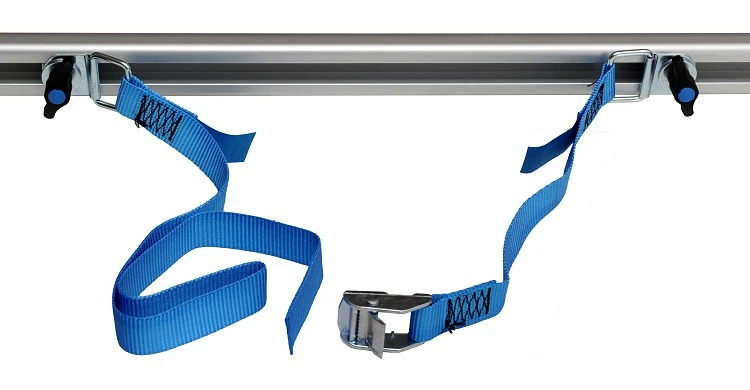 The test ensures that the equipment installed inside the vehicle is not displaced in any way. TÜV Rheinland Group is one of the largest international groups that specialize in the technical testing certificate sector. The turnover of the group exceeds 900 million Euros per fiscal year. 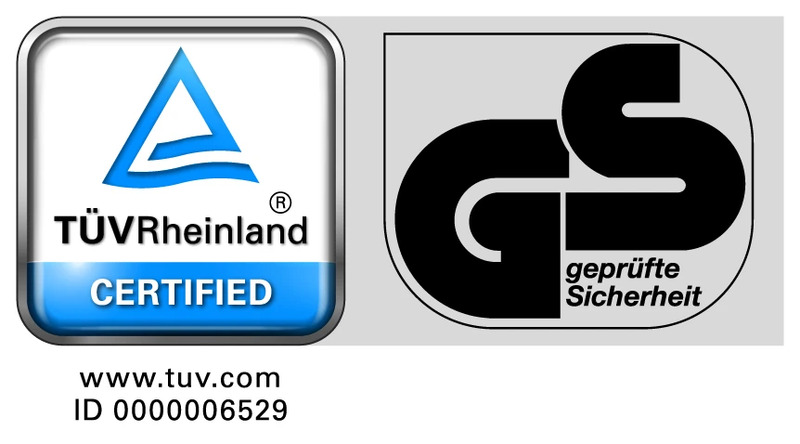 TÜV Rheinland Group is authorized by the German Government to issue the GS certificate. Furthermore, this certificate does not focus on operational issues or product features, but it tests the Syncro products to ensure their complete operational safety. Their high quality and robust manufacturing materials prevent, even in more serious car crashes, the separation of the potentially dangerous parts. In addition, they guarantee that the transported materials are completely fixed and immovable in the van. TUV Rheinland put Syncro System luggage racks and utility racks through a demanding series of tests according to the DIN 75302 safety regulation standards which vary according to the size of the van: 100 kg for small vans, 150 kg for mid-range vans, and 200 kg for large vans. loaded to its maximum capacity. The second test involved pulling on the rack horizontally while the van was stopped. The force exerted was equal to four times the declared capacity (i.e. 400 kg, 600 kg, 800 kg). 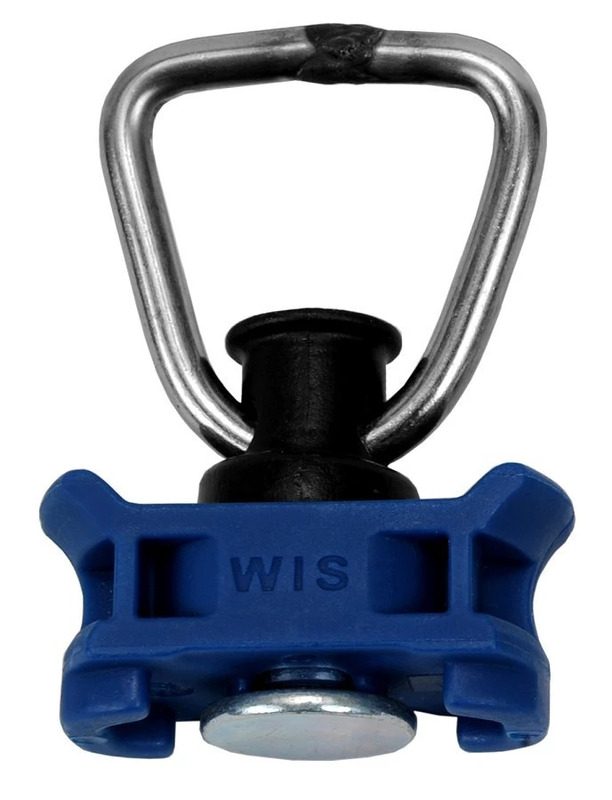 inclination of 20° to the axis of the rack with a force equal to four times the declared capacity. The fourth test was a lift of 255 kg. load (attached to the rack) for 10 minutes, with van stopped. In the first part, the van had to break suddenly and violently, while in the other parts, the van was not in motion and the force exerted on the rack from different directions was created by a separate vehicle. It is easy to see that the tests were all very challenging, but nonetheless, the Syncro System racks passed them all without difficulty and without even a single sign of strain or breaking. 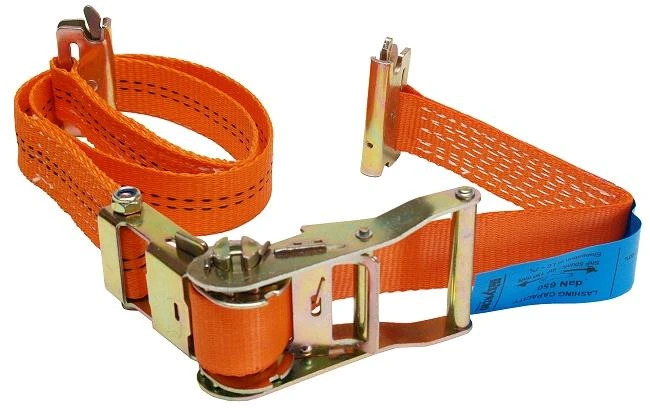 Straps are often used in conjunctions with hooks to secure cargo in vans. 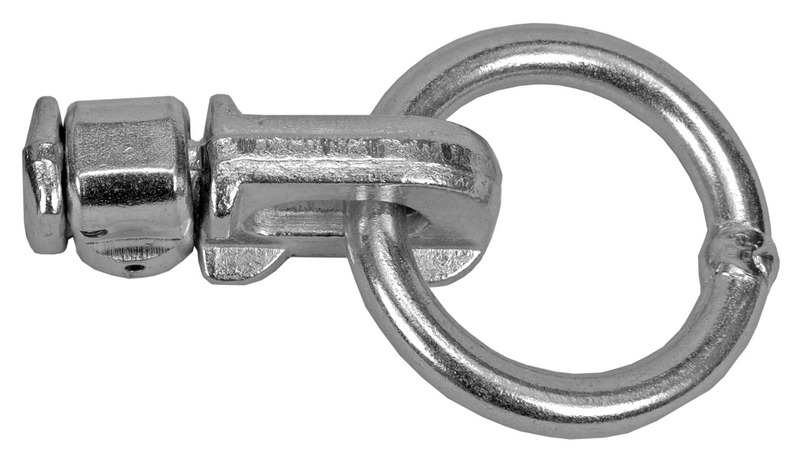 The ROTAL-GNC, ROTAL-GNC.AN and GNBC hooks presented in the cargo retaining accessories of the Syncro System catalogue have been tested according to ISO 27956:2009 , the standard that establishes requirements and test methods for delivery van cargo securing equipment. The tests involved the application of a load of 1000 kg, a force equivalent to 2.5 kN, at angles of traction of 0°and 60°. 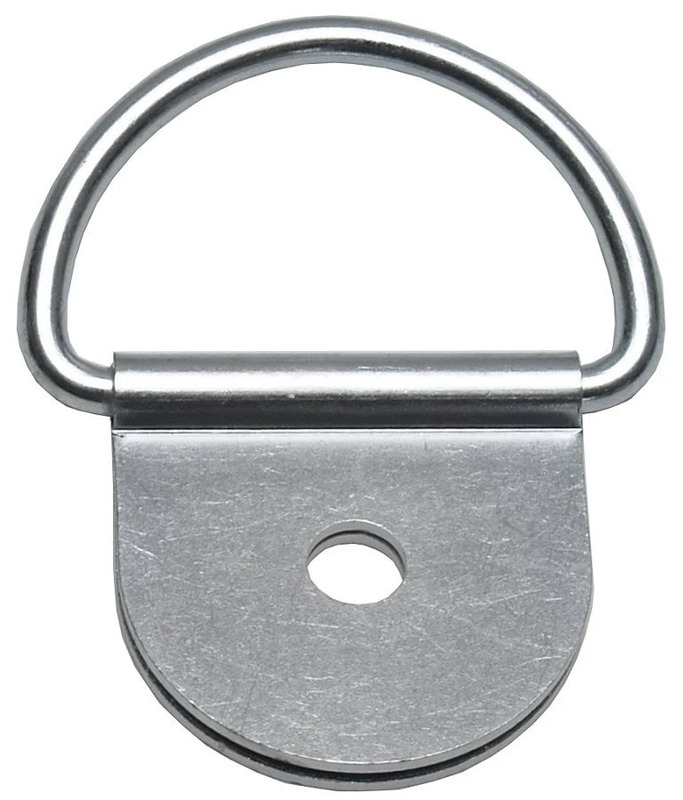 All the Syncro hooks tested conformed to requirements! Some even exceeded them and demonstrated an ability to withstand even double the force, i.e. 5 kN, without damage. All the components of Syncro System are designed and fabricated to Directives, Italian Law and harmonized standards related to this type of product. Normal tests for design strength and resistance UNI U41.10.092.0 and UNI 8581 - 8604 - 8605 - 9604. The competent authorities may access all the technical files and information concerning components, accessories mounted, shop drawings, layouts and test results, use and maintenance manuals which are kept in Francom’s head office. All materials conform with Health and Safety standards. On 15 November 2016, Cribis D&B, a company in the CRIF Group and part of the Dun & Bradstreet international network, awarded Francom S.p.A. and Syncro System Italy certification as “Cribis Prime Companies” for achieving the highest possible level of commercial reliability. This coveted certification is granted only to a small number of companies around the world (only 3% of over 250 million companies assessed), considered able to guarantee customers, suppliers and lenders zero risk in all business transactions. 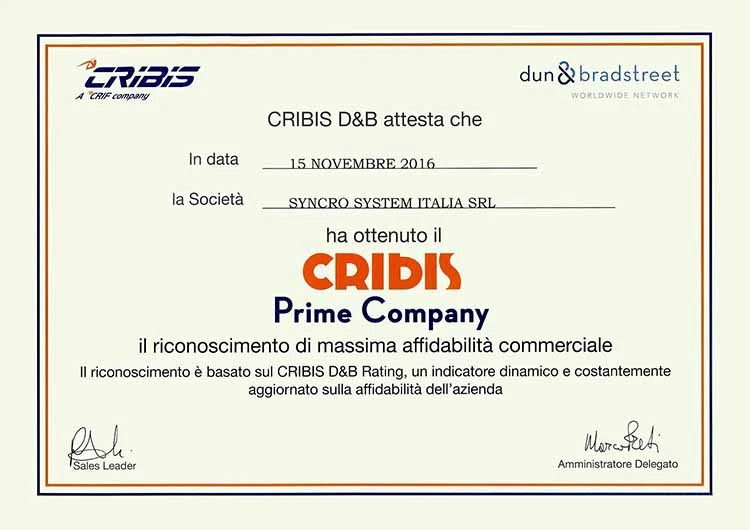 Certification is based on the Cribis D&B Rating, a dynamic indicator that is continuously updated and rates a company’s dependability on the basis of criteria such as stability, solvency and punctuality in payments.